July 2007: It has been five years. I think it's time to accept it. Ian Gibson isn't coming back. Neither, in all likelihood, is Samantha Slade. This is the story of her ignoble and stupid end. It should not, honestly, have come to this. 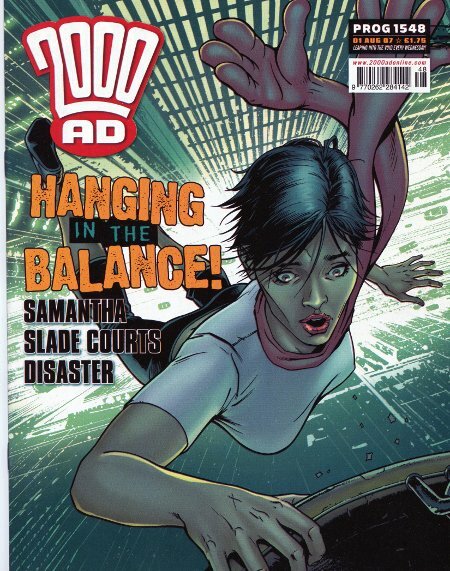 So, to recap: in the early 2000s, Ian Gibson started drawing color pin-ups of Sam Slade's granddaughter Samantha, whom he designed. Perhaps, it was thought, there might be some interest from John Wagner in returning to the world of Robo-Hunter...? Wagner passed on the idea, but his longtime associate and former co-writer Alan Grant picked up on it, and, in December 2003, the first new Robo-Hunter story with Samantha, the first Gibson-drawn, canonical Slade story since 1985's "Farewell, My Billions," debuted. It had its fans and it had its detractors, but even the most lovelorn of us must have agreed that Gibson had turned in superior work in the past. Two follow-up stories in 2004 saw the artwork continue to divide opinion. Alan Grant's writing was solid and reliable, but Gibson was clearly not giving this his full attention. It is my contention that the subpar artwork proved the death knell for the character. Those who disliked the series frequently called out its slipshod appearance. Their arguments had merit: Gibson was not drawing backgrounds, not being in any way innovative, in short, he was phoning it in. This was very curious, since he created the character. The fourth story, 2005's "Stim!," was a mammoth improvement. This upswing continued in 2007's "Casino Royal," as both of these featured far more intensive and considered artwork from Gibson, and not just because he remembered to include some backgrounds. The writing was solid and amusing and certainly had that old Slade spirit. It is likely, however, that readers who found the three 2003-04 stories unacceptably lazy and slapdash had their minds made up and were not prepared to reconsider the genuine improvements that Gibson had made. "Casino Royal" ended with Samantha jailed and a new arch-enemy triumphing over her, gloating ever so briefly before dismissing her as irrelevant, from an island getaway. The bad guy had won, and our heroine was jailed, perhaps for good. But wait! It turned out that Alan Grant had a whole pile of new storylines and subplots in which to indulge. "Casino Royal" was actually to be the first in a major story arc for Samantha that would take in new characters and new settings as she globetrotted her way to revenge against the criminal Five of Spades. And so, just three months after the cliffhanging conclusion of "Casino Royal," Samantha was back in a new five-parter called "I, Jailbird." But something was terribly, terribly wrong. Gibson was not bringing his A-game anymore. Not even his C-game. It's fair and reasonable to say that Gibson is a, shall we say, mercurial talent. His enthusiasm comes and goes, he's curmudgeonly, grouchy, a very harsh critic of his own work, and he has spoken with considerable candor and disappointment about some of his art that failed to meet his own high standards. I consider him absolutely a genius and one of the most important and influential talents in the comic medium. And the ten pages that he bothered to draw from the 25 page script are the worst ten pages he's ever drawn. They are the absolute nadir of his work. I am privy to a personal email between Gibson and a reader that I should not have been allowed to see, and from which I won't quote, but in it, he honestly and dismissively admitted that the script, the worst in a long series of scripts that he disliked, had bored him so much that he abandoned it, his work not even half-done, and, from the look of it, completed over the course of about an hour and a half. In the sequence above, selected for thematic continuity with the sequence below, he didn't even bother drawing the vertical stripes on Samantha's prison uniform. Shortly afterward, in one of his columns for the website Den of Geek, he made a passive-aggressive comment about how he was unhappy with his page rate, thinking it should be proportional to the always-increasing cover price of the comic. Way to burn bridges there, Gibson. Massimo Belardinelli deserved better than to have this tribute illustrated so poorly. I feel really strongly about that. So, anyway, Grant had written another perfectly good little Samantha story, which has the lunatic and frantic pace that any good Robo-Hunter story should. Prison overcrowding has given Samantha the opportunity for very early release, and, with the "help" of a defense attorney droid who looks like Leo McKern, this incredibly violent mind-of-its-own scarf, and her two idiot assistants - rebuilt since the last story and determined to cause more trouble - Samantha ends up escaping from the Old Bailey when she was just about to be paroled, and is on the lam, bound for Calais, where she hopes to assist another new character, Trudy, who claims to be the rightful Queen of France. Coming in to pinch-hit for Gibson is the reliable Anthony Williams. In the early nineties, when Mark Millar was writing those really bad and bloodthirsty Robo-Hunter stories that made everybody question their resolve for living, Williams was one of the six (six?!?!) artists who contributed, and did not do a bad job at all. Those were actually two really good stories, so long as you look at the pictures and don't read the word balloons. Williams is a good go-to artist, I think. He doesn't, honestly, have that unpredictable and wild edge that really defines a 2000 AD art droid as a classic model in the eyes of the fandom, but he does the job reliably and I'm always glad to see his work. That said, something is terribly, terribly wrong when anybody says "Thank God that Ian Gibson's gone and Anthony Williams is here." That is what I said. Robo-Hunter ended with Samantha swimming the last few meters across the English Channel, a caption at the bottom of the final page promising us that she would return soon in a story called "La Revolution Robotique." Buckaroo Banzai will probably fight the World Crime League before that happens. I think that, behind the scenes, the editor was not able to resolve the differences with Gibson about his unhappiness with the script or his page rate, and Gibson has not worked for 2000 AD since. His last material to appear to date has been a pin-up of Halo Jones that appeared in prog 1550, four weeks after his last Robo-Hunter page. It was probably too late to do anything about the final episode, far too late for a rewrite, and so it was published with the "Revolution" tagline, though I suspect that all involved were glumly aware that it was very unlikely. Not to knock the really excellent and underappreciated work on Sam Slade by Peter Hogan and Rian Hughes in 1993-94, but the long, considered opinion at 2000 AD since Bishop's time as editor in '97 has been that characters should be managed by their creators. Without Gibson, there is no Samantha. And I think that's what aggravates me the most about how Gibson handled this. Look, I'm just a loudmouthed fan with a blog and a love of the comic, and I often speak with an intemperate, downright American-volume opinion that has often resulted in comical misunderstandings between myself and more reasonable people in Europe. But seriously, folks, why the blankety-blank did Ian Gibson not pick up the telephone and actually talk to Alan Grant about what he wanted from the scripts? I do not understand this, and I never will understand this. It really breaks my heart that two of my favorite comic creators came together to put together what should have been a real 2000 AD classic for the modern day, with a much-needed female lead, and the damn thing fizzled because of such dumb reasons and a lack of communication. I don't know what the heck Gibson wanted, because as far as I can see, the scripts were on target and terrific almost all of the time, but I know how he could have addressed it. He should have picked up the phone and called Alan Grant and said "I didn't like that one, and here's why. Let's make the next one better." It should not have ended like this. Samantha should have settled that Robotique Revolution in '08 (in a twenty-episode mega-epic, yes, indeed), and then she should have solved some lunatic problem on the Orient Express or something while making her way to the Pacific to get even with that darn playing card. Samantha should have become, and been promoted as, 2000 AD's lead female character, a woman not superhumanly beautiful or drawn cheesecake-style, a woman who didn't need a male compatriot, just mind-blowlingly aggravating robot scarves and cigars and... frog-kit-things. She was just a competent, fun character who relied on her wits and her intelligence and learned as she went, and was often in way over her head in classic comedy moments. If you'll forgive me getting political, 2000 AD really has made great steps lately in presenting positive female characters. Maggie Roth from Angel Zero, Rowan Morrigan from Age of the Wolf, and Mariah Kiss from Indigo Prime are all examples of the character that we'd hope to see more of in the comic. They're sort of undermined a little by retrograde steps like allowing Judge Maitland, in her second appearance last month, to show off her cleavage so ridiculously, but overall, the comic is definitely making long-overdue steps on the right path. Samantha, despite her lineage as a descendant of a male lead character - that problem affects both Judge Anderson and Durham Red, also recently written by Alan Grant - pointed the way forward. She should be here still, and even though the realist in me accepts that she's probably never coming back - five years is a long time - it's not too late. Maggie's story was told in a single serial, writer Alec Worley has explained that the third Age of the Wolf will be the last, and somehow, stupidly, Indigo Prime has not resurfaced after its TRIUMPHANT twelve-part return last year, and so who the heck knows when Mariah will be back, or whether she'll get any lead time amid all those other characters, so there is a definite gap. Anthony Williams hasn't had the opportunity for any new work since Sinister Dexter was shelved, and I would honestly welcome him as the character's permanent artist. If we ever do get to see that blasted Revolution Robotique, the only complaints would be from nonscrots, grexnixes, and people who just plain don't like girls. The sensible among us miss Samantha. We're waiting on the shores of the continent, fearing that she's been swimming an awfully long time. But you know... just last week, Tharg announced that The Simping Detective was coming back after a five year absence. With a new artist, too. Next time, oh, grouchity-grouch, I dunno, Caballistics or something, I guess. See you in seven. *Actually, that wasn't accurate. Gibson's last 2000 AD work came about six months later, when a really subpar inventory episode of Dredd was burned off in prog 1576.